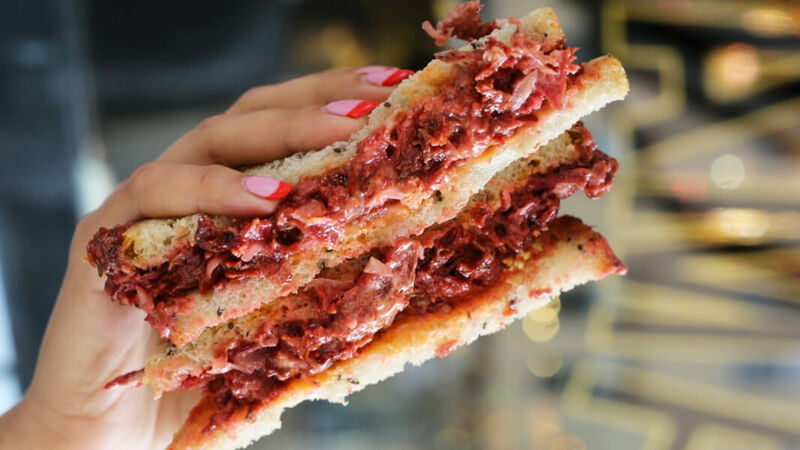 LA-based vegan Jewish deli Mort & Betty’s is set to launch on-the-go options for its mushroom pastrami, carrot salmon-style lox, and meatless corned beef made from beets. Founded by chef Megan Tucker, Mort & Betty’s specializes in beloved Jewish deli foods as well as fish-free whitefish salad made from carrots. All ingredients are sourced as locally as possible. Tucker dishes out her vegan Jewish delicacies, such as carrot lox on bagels and mushroom pastrami sandwiches in pop-ups across LA. Last December, the website My Jewish Learning identified plant-based Jewish cuisine as one of the top food trends of 2019. The LA-based vegan deli believes that it is possible to enjoy food connected to family and culture while letting go of animal ingredients. “The end result may even be more vibrant, compassionate, and more alive. I hope that Mort & Betty’s provides this to the lovers of lox, pastrami, corned beef, and kreplach,” states the website. Mort & Betty’s isn’t the only business to provide vegan versions of traditional vegan Jewish deli foods. Brooklyn’s Champs Diner makes a meatless pastrami sandwich featuring seitan made by Queens-based Blackbird Foods. Champs specializes in classic deli and diner-style vegan food. Since opening five years ago, the restaurant has become a packed brunch hotspot known for its “no fuss, laid back attitude,” as it explains on its website. Orchard Grocer, a vegan mini-mart in NYC’s Lower East Side neighborhood, serves carrot lox on a bagel with dairy-free cream cheese with capers and dill and reuben made with beet-brined seitan. Its lox was featured in an article on vegan food in New York Magazine. Brooklyn-based vegan cheese shop Riverdel also makes fish-free lox from thinly-sliced carrot marinated in a brine. Australia’s Smith & Deli, the spinoff restaurant of the popular Smith & Daughters, also serves a meatless reuben. Last year pics of a vegan brisket made by Hollywood producer Kevin Biegel took over the Internet. Retail launch locations have not yet been announced for Mort & Betty’s, but the website states that the products will be sold in the LA-based grocery store, Besties Vegan Paradise. A few new pop-up dates have also been set. Mort & Betty’s will appear at the outdoor food festival Smorgasburg LA’s Super Vegan Saturday on February 4. Tucker eventually hopes to bring Mort & Betty’sto other cities across the U.S.